After a morning working industriously, I took a city tour of Lima in the afternoon. It's something I've done before, but it was arranged and the only option was to wander around on my own. That's something I've done before too, blissful in my ignorance of what was actually a fairly dodgy thing to do, since I strayed well outside the affluent district of Miraflores. Having been sternly warned in Iquitos - Iquitos! - about how dangerous Lima is, I came over feeble an allowed myself to be guided by Jean Carlos. So we started, as usual, at the Park of Love on the edge of the cliff looking down at the surf rolling in from the Pacific, and up at the microlight pilots suddenly blotting out the sunshine as they passed along the edge. Yes, sunshine! It's unusual in Lima at this (or any) time of year - it's a grey and foggy place normally, which explains the brightly painted buildings throughout the city. It's also amazingly dry - never rains. Well, only 15mm a year, which is pretty much the same thing. The love-lock thing, buy the way, seems scarcely to have started here, with just two lonely padlocks on the nearby railings. Leaving the, frankly, ugly huge statue of two lovers, we drove past Huaca Pallaya, a very much pre-Inca pyramid of mud-brick blocks; and through San Isidro, a blatantly affluent suburb of olive-tree parks, high walls and video surveillance of the mock-Tudor and French-style homes. Then, as a contrast, past Victoria where no rules apply and you can get anything for a (low) price; and into the colonial centre. Here are squares with fountains and statues surrounded by stately government buildings, the cathedral, churches and people, lots of people including a highly visible, if somewhat bored-looking, security presence. San Francisco church is obligatory: cloisters, oil paintings, ornate gold-leaf altar and shrines, one of them to the Virgin Mary as a baby. 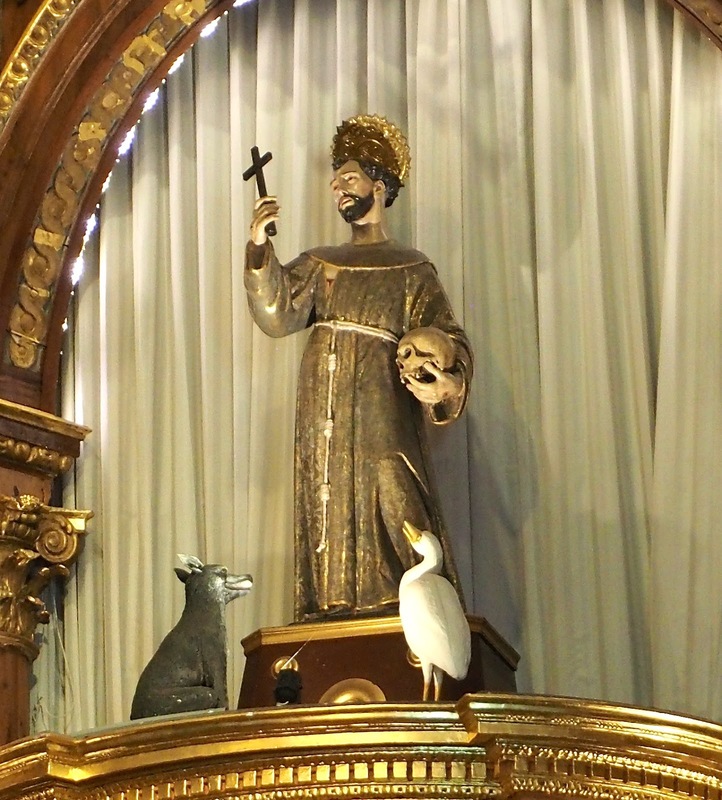 Up above the altar the statue of St Francis is accompanied by a dog, an egret and a mouse, which seems pleasantly even-handed - though he also holds a skull. Down below are plenty more in the catacombs, thousands of bodies now neatly arranged into bins of femurs, skulls and humerus, sometimes in patterns. Quite bizarre. And that was Lima, and Peru. Tonight an 11.50pm flight takes me north to Quito.